AKCAKALE, Turkey - Syrian Kurdish fighters closed in on the outskirts of a strategic Islamic State of Iraq and Syria-held town on the Turkish border Sunday, Kurdish officials and an activist group said, potentially cutting off a key supply line for the extremists' nearby de facto capital. Meanwhile, hundreds trying to flee the offensive pressed against the barbed wire fences separating the town from Turkey, as masked militants likely belonging to ISIS could be seen as Turkish soldiers watched from the other side. On Sunday, Kurdish official Idriss Naasan said that ISIS fighters have fled from Suluk, a few miles southwest of Tal Abyad, and that Kurds now hold the town. The Britain-based Syrian Observatory for Human Rights also said ISIS fighters had withdrawn. The Observatory said the Kurds are about 3 miles from Tal Abyad. "It's only a matter of time before this area is liberated," Naasan told The Associated Press by telephone from northern Syria, saying the Kurds surround Tal Abyad from the east, west and south. 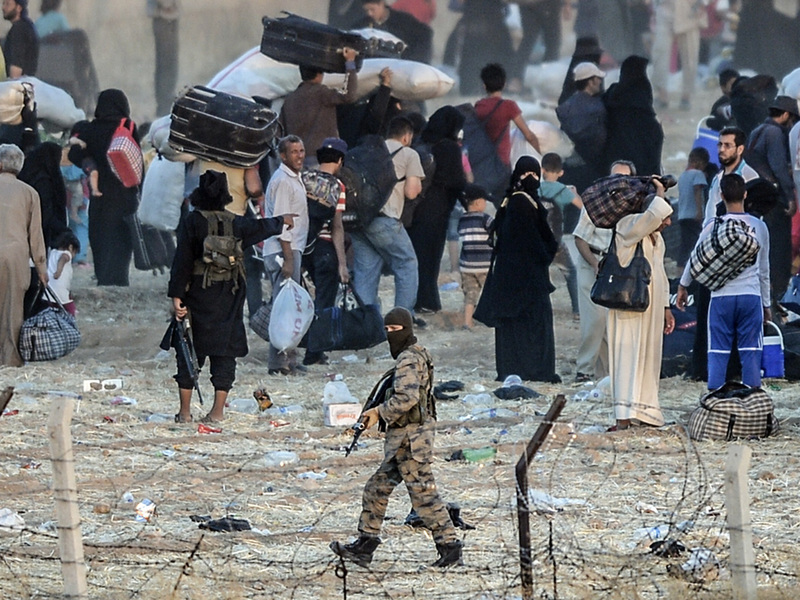 The Turkish border - and the soldiers there - now hem the extremists in from the north. However, Rami Abdurrahman, who heads the Observatory, said ISIS fighters still control the road linking the Turkish border with Raqqa. Since the beginning of May, members of the main Syrian Kurdish force, the People's Protection Units, or YPG, have taken more than 200 Kurdish and Christian towns in northeastern Syria, as well as strategic mountains seized earlier by ISIS. They have pushed into Raqqa province, a stronghold of ISIS. Along the way, they have picked up ammunition, weapons and vehicles left behind by the jihadis, almost mirroring the way the extremists overran Iraqi positions last year in their sweep across a third of that country. ISIS has declared areas of Syria and Iraq is holds as part of its self-declared "caliphate," demanding the loyalty of the world's Muslims. Their gruesome propaganda videos of mass killings have drawn in foreign fighters, many coming in over the border from Syria. In recent weeks, ISIS has relied more and more on foreign fighters to carry out the coordinated suicide bombings that have pushed out Iraqi forces. Even if Kurds cut off Tal Abyad from Raqqa, ISIS still could bring in fighters across the border in Syria's Aleppo province, where they still hold ground. However, that would be a round-about route that could expose them to other fighting amid the long Syrian civil war against President Bashar Assad. In Syria, a country now split mostly between Islamic militants and forces loyal to Assad, the U.S. has found a reliable partner in the YPG, the country's strongest Kurdish militia. They are moderate, mostly secular fighters, driven by revolutionary fervor and a desire to eventually have a nation of their own carved out in the region. U.S. airstrikes continued Sunday in the area, as an Associated Press journalist on the Turkish side of the border from Tal Abyad saw one strike east of the town. Nasser Haj Mansour, a defense official in Syria's Kurdish region, said YPG officials are coordinating with the U.S.-led coalition regarding a possible attack on Tal Abyad. He added that the aerial coverage prevented ISIS from brining reinforcements to the area.